The Marquette Board of Light and Power (MBLP) answered a call for Mutual Aid help from the Cloverland Electric Cooperative in the Eastern Upper Peninsula following a blizzard that started the morning of the Sunday, February 24 with winds clocked at 79 miles per hour causing more than 6,000 power outages in Cloverland’s service territory. 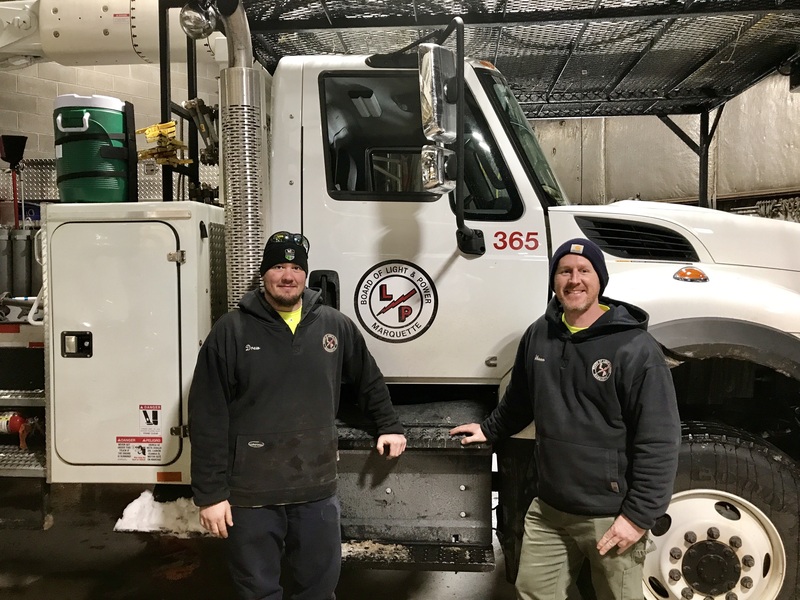 MBLP Journey Line Electricians Drew Ahonen and Shawn Sheldon travelled to the Newberry/McMillan area in the eastern Upper Peninsula the afternoon of Monday, February 25. After working some long hours helping to restore electric service to Cloverland customers, they returned safely to the MBLP on Tuesday, Feb. 26. When possible, the MBLP provides Mutual Aid assistance to Michigan-based utilities. At the January 22, 2019, Board Meeting, INNOVA Global will give a presentation to the Board and public. Items that will be covered are Marquette Energy Center's existing noise levels, acoustic design criteria and proposed retrofit plan. Click MEC RICE Plant Acoustic Retrofit Plan for the complete presentation. 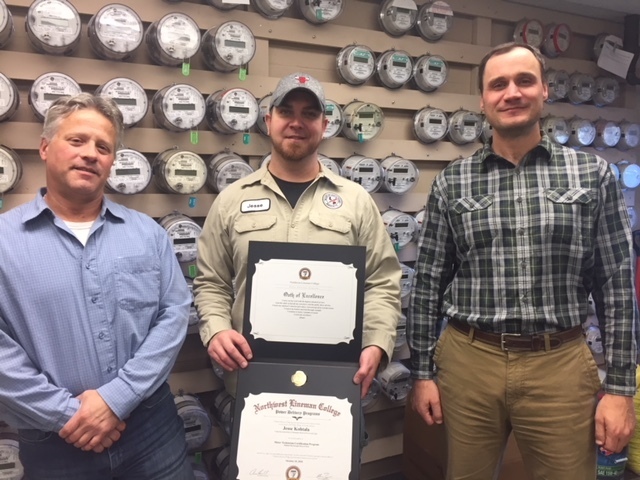 Marquette Board of Light and Power (MBLP) Supervisor of Metering and Energy Programs Kevin Downs, left, and MBLP Executive Director Tom Carpenter, right, are shown congratulating MBLP Meter Electrician Jesse Kohtala for his recent completion of the Meter Technician Certificate Program through the Northwest Lineman College. The certification program included three on-line modules averaging 150-plus hours of training per module and covered training in basic electrical theory, transformer basics, metering and electrical test equipment, safety, troubleshooting and crew leadership. Northwest Lineman College holds two accreditations. On November 6, 2018, voters in the City of Marquette approved a change in the City Charter. The proposal changed the way PILT is calculated between the City of Marquette and the Marquette Board of Light and Power (BLP). Both the City and the BLP worked together to develop the change. For the benefit of our customers, following are answers to some common questions about the change to the City Charter. PILT stands for “Payment in Lieu of Taxes.” PILT is paid annually by the BLP instead of property taxes to the City of Marquette as established by the City Charter. Is the PILT something new? No, the PILT has been in place for a long time. I live in the City and am a BLP customer. Will this affect my electric bill? No, the change in the formula for calculating the PILT will simplify the calculation administratively but the resulting PILT payment should be substantially the same as the current PILT. The customer should not see a difference in the amount or the calculation of his or her electric bill. My mother lives outside the City limits and is also, a BLP customer. Will this affect her electric bill? How was the PILT calculated before the change? The PILT formula was based on the total capital assets of the BLP and required annual calculation and adjustment in coordination with the City assessor’s office. The PILT will be calculated at 5.5% of the BLP’s annual operating revenues. How does this change compare to how other electric municipalities paying their PILT? A majority of electric municipalities in the state of Michigan pay their PILT based a percentage of operating revenues. In choosing the percentage rate the BLP and the City mutually agreed to a rate that would be substantially equivalent to the current PILT payment. The percentage was also bench marked against other municipalities and found to be in line with national averages for publicly owned utilities such as the BLP. Why the change was made? The change was made to simplify the administration of the PILT process. Before the charter change, there was much administrative time required to make the annual calculation. Staff at both the City and the BLP had to classify, value, and account for the variety of capital assets held by the BLP. This process was also subject to changes in state law, which could create unintended consequences for the PILT calculation: the most recent example being the state’s change to personal property taxes. Changing the PILT formula to a simple percentage of operating revenues saved administrative time and resources. This change also provides for a more consistent budgeting process and better long term planning for both the City and the BLP. What was the text of the ballot proposal? Shall Sections 11-6 and 11-7 of Chapter 11 of the Marquette City Charter be amended to revise the calculation related to the payment of a portion of electric light and power utility system revenues to the City of Marquette, which payment is made in lieu of taxes that would be paid on electric light and power utility system property if it were privately owned? Where can I read the current City Charter? Beginning Monday, September 24, 2018, the Marquette Board of Light and Power (MBLP) will begin brushing overhead power lines in the right-of-ways and easements in the Shiras Hills subdivision (East and West) within the City of Marquette. Brushing activities are an important component of the MBLP’s Vegetation Management program; the goal of this program is to ensure continuous and reliable electric service to our customers while allowing system maintenance to be performed safely and efficiently as needed. Brushing activities include the removal and trimming of tree limbs, branches, and other vegetation along overhead power lines, but does not include the removal of lawn shrubs, fruit trees, or other ornamentals. Brush, aspen, pine, and other small timber will be chipped and disposed of by the MBLP, this includes all Ash in an effort to help prevent the spread of Emerald Ash Borer. Saleable hardwood, four inches or greater in diameter, will be left along the edge of the road right-of-ways and utility easements. Landowners adjoining the brushed right-of-ways and easements are permitted to remove cut timber for personal use. Upon request, remaining timber will be picked up and disposed of by the MBLP after the project has been completed. For the safety of the public, our employees, and contractors, please do not approach crews while they are working. The tasks that they perform put them near energized equipment where the utmost focus and concentration is necessary. MBLP Vegetation Management program questions should be directed to Ben Collins, Manager of Distribution Engineering Services, at (906) 228-0300. Information regarding invasive species and how to ensure the safety and quality of our forests is available from the Marquette Conservation District at www.marquettecd.com. Additional resources are also available at www.dontmovefirewood.org and from the Michigan Department of Agriculture & Rural Development.